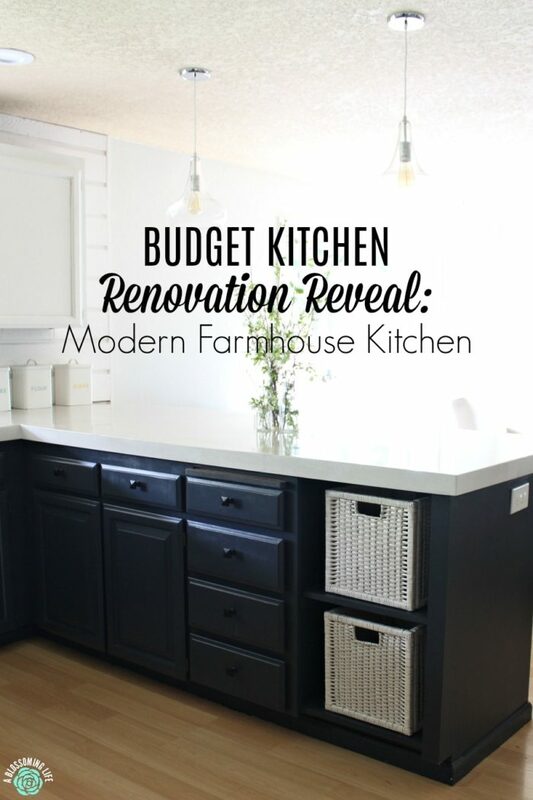 This modern farmhouse kitchen renovation on a budget is crazy to me, and I’m absolutely in love. It’s like you just started dating a new kitchen and you’re getting all the butterflies in your stomach every time you see the new kitchen. Whatever that means. Y’all! We have been working on our kitchen for almost two months! You know how long that feels like when you have little kids? An eternity! 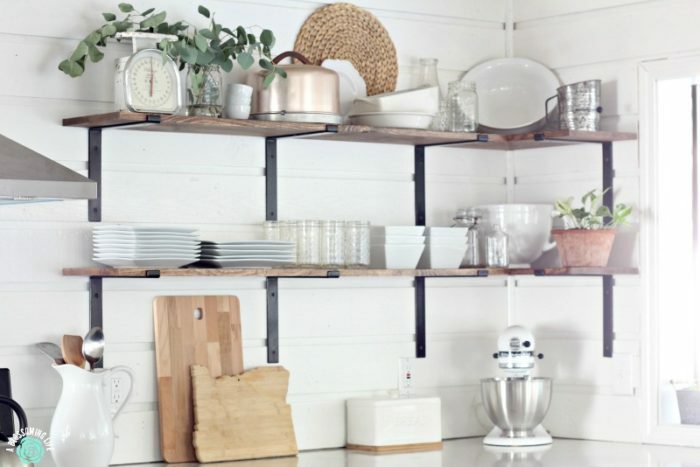 I shared the open shelving reveal last week, you can see them here… or just scroll down. 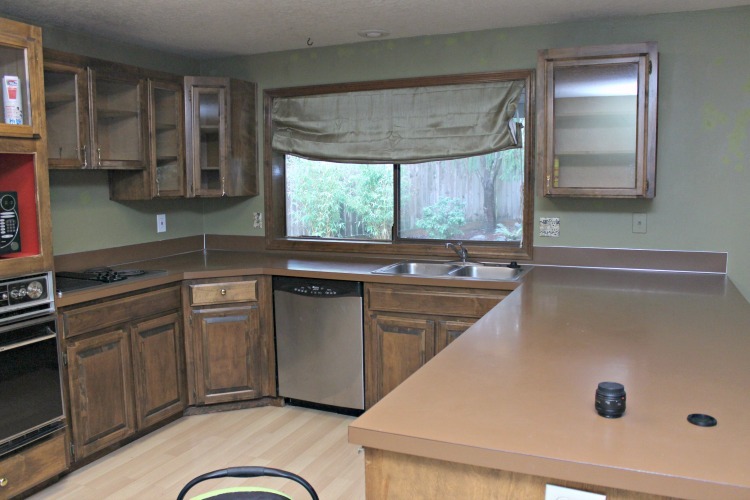 Shall we take a peak at the before pictures of our wonderful kitchen? This post contains affiliate links. 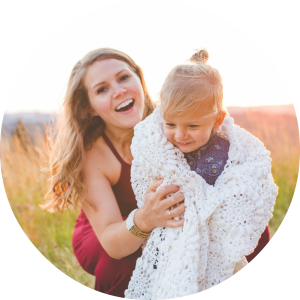 Affiliate links help support A Blossoming Life at no extra cost to you! It’s really hard to believe this is even the same space! Ain’t she a beaut? Yeah, not hardly. 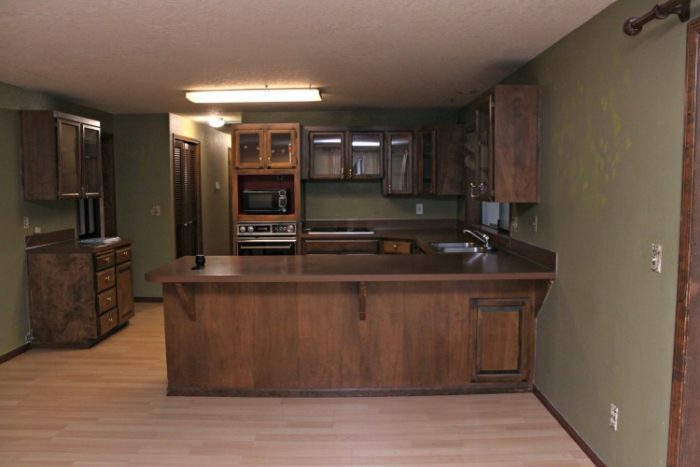 There were many things wrong with this dark and gloomy kitchen, including an oven the size of a child’s Easy Bake Oven. All the appliances (minus the dishwasher) were from 1978 and still in working condition (good grief, ugly appliances shouldn’t be lasting that long). But we really wanted to brighten and update the space, so we ended up replacing all of them. Not going to lie, there are still a few things that need to be done. A little caulk here and there, some trim, but I just couldn’t help but show her off. 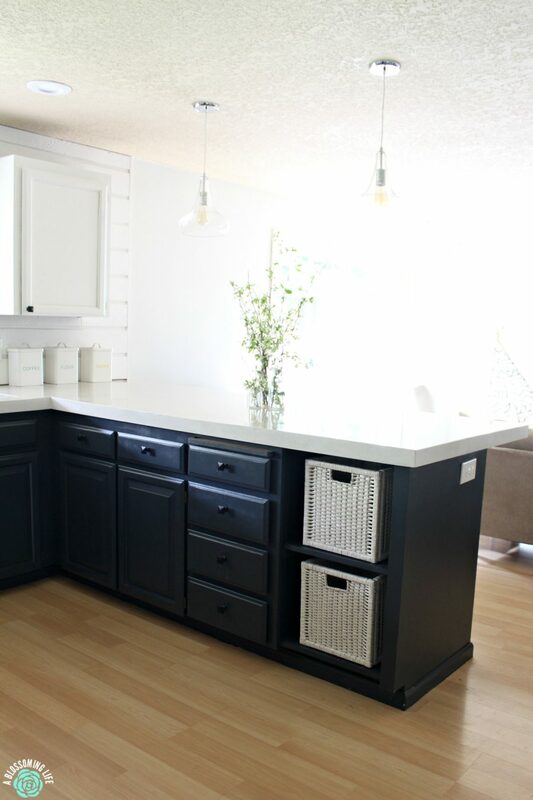 How we updated the kitchen on a limited budget! Let me just tell you, this project took twice as long as we expected and cost twice the amount we wanted to spend. Of course, there were setbacks and things that popped up that we weren’t anticipating, but that’s okay, because the results are still amazing on a pretty small budget. 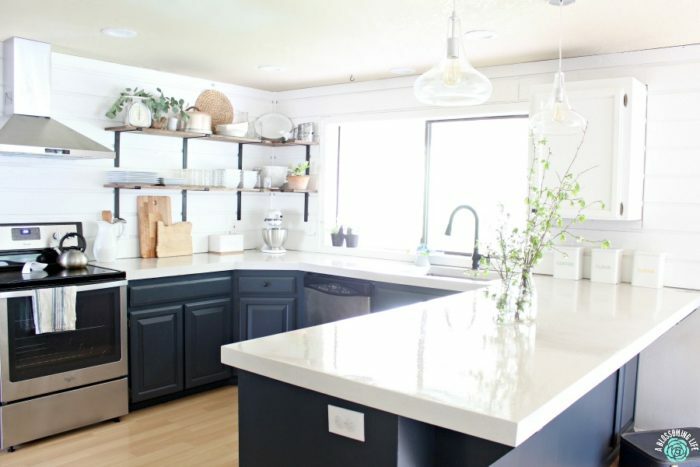 The average kitchen renovation costs between $22,000 and $52,000! We spent less than $7,000 with appliances included. We still need to purchase some bar stools for the peninsula, but they are not in the budget right now, so we will save up. We painted the shiplap and walls my favorite white. We also painted the cabinets a beautiful, dark, steel blue. Friends kept telling me it was going to be such a horrible job, but really, it wasn’t that bad. I was also hyped up on caffeine when I did it, sooo there’s that. Sanded, primed, and painted the cabinets with two coats of the blue. I purchased an awesome and cheap paint sprayer (similar to this one) and sprayed all the doors and used a foam roller on all the bases to get a super smooth finish. The new look was completed with new door hardware (these beautiful iron hardware) . If you saw on Instagram stories, I hung the doors by myself during nap time. I balanced them with my foot as I screwed them in. You should use a second person, though…it won’t take as long that way. Updated and replaced some of the upper cabinets! We removed some of the upper cabinets because they weren’t all the same height, and we replaced them with open shelves. The other upper cabinets had glass fronts, and I wanted to hide some of our not-so-pretty kitchen things. So, we took out the glass and replaced it with some thin wood. 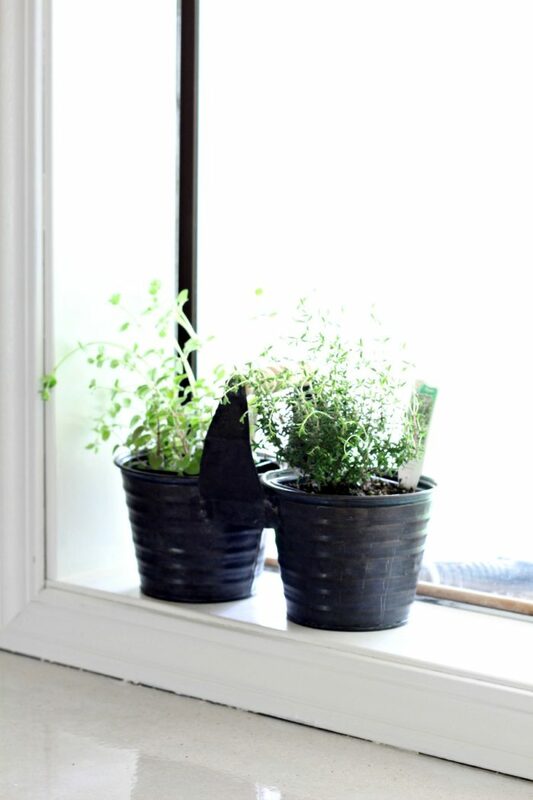 Spray painted them with the same color white as the shiplap and put new hardware on them. ? Installed shiplap as a backsplash! I really wanted tile, but was scared to tackle this project myself, so we went with the next best thing (it was also free)… shiplap. 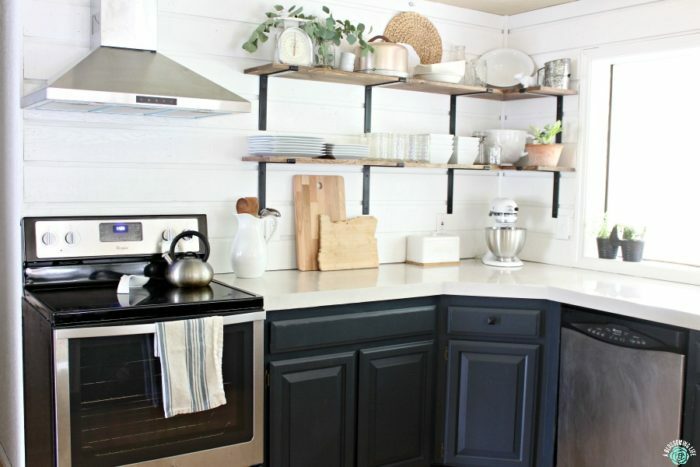 We had shiplap in our garage that was being used as a wall divider, so we took it down, reinstalled it in the kitchen, and painted it. 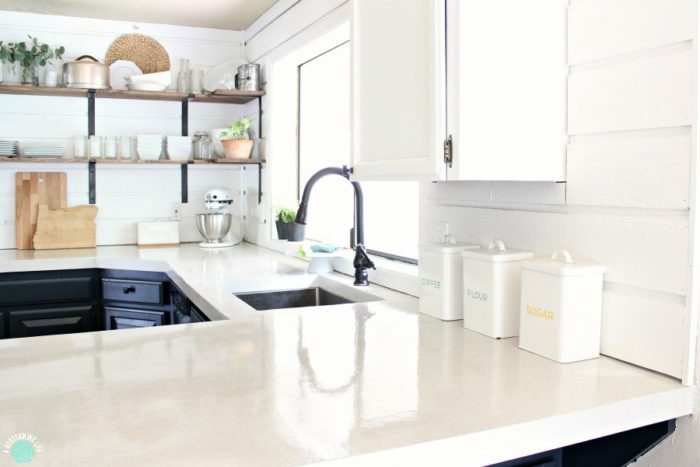 We went with concrete, because it was much less expensive than granite or manufactured quartz countertops especially with the amount of counter space we have, but is still super durable and pretty. We went with an off-white grayish color. Our friend, Chris, from Arete Woodworking installed them, along with helping with other various things like installing the stainless steel range hood , faucet, and sink. We seriously couldn’t have done it without him, and he did such a wonderful job. We did end up having an issue with the sealer, so he sanded the whole thing down and reapplied a new epoxy. It’s basically a bar top epoxy and everrrrything just wipes off. It’s amazing. Updated the Sink and Faucet! The stainless steel sink (same one, but is the 28 inch) and the farmhouse oil rubbed bronze faucet were both a really great price, and I’m loving it. Deep sinks and awesome faucets are game changers. Sooo many dishes that I don’t want to wash can fit in there. Seriously, I had to take a few more photos for this post and it was after lunch, so the sink was FULL of dishes. Can you even tell? Nope! The sink bottom isn’t super sloped, so it can be challenging to get food down the disposal (especially when I’m trying not to get handsy with soggy plate scraps), but it doesn’t really bother me. We saved almost $200 from choosing these options, rather than name brands at a big box store. 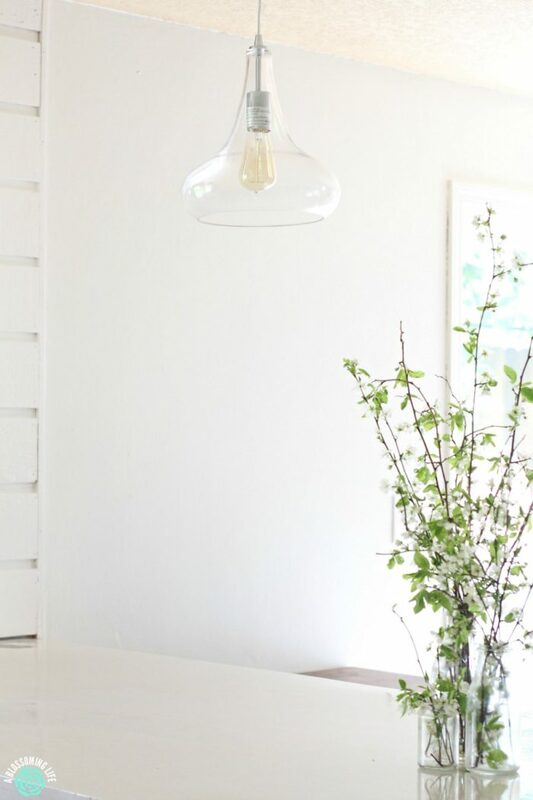 The old light was a shop light… why, oh why, would someone install that inside a kitchen? We took it out and had electricians install these glass pendants and some can lights (the lights and the countertops were the most expensive parts since we didn’t DIY these). 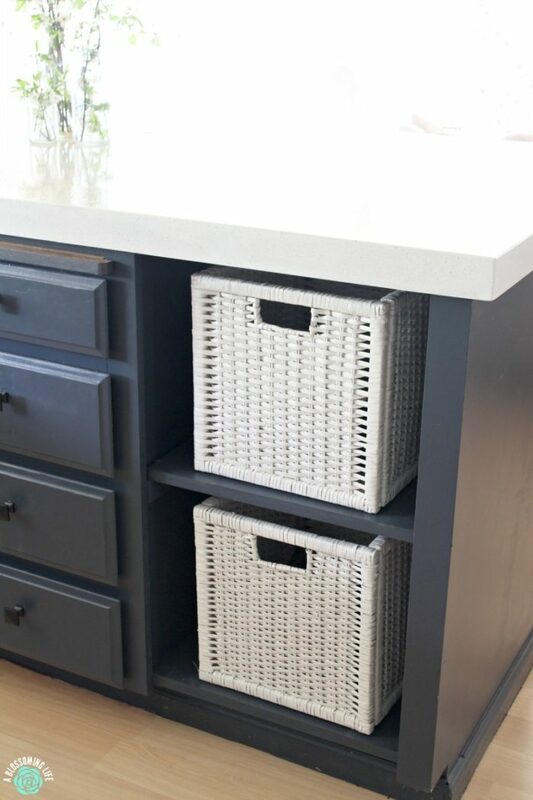 There was a very outdated 70’s trash compactor that we removed, and in its place put shelving and baskets from Ikea (they are like $10 apiece – what a steal!). We wanted it to look like it was always there and not a random thought – which it kind of is – so we will eventually add molding to make it look like it was a built in. Y’all, it’s been ages since I decided to decorate anything. I blame it on lack of inspiration with our prior outdated 70’s rental. Nothing could help that poor soul. Anyway, I had a limited budget to decorate with, so we used most things we had laying around and ended up spending $68 on a few plants, some adorable pots, a bread box from World Market, and a vintage kitchen scale my husband found. Not too shabby. I forgot to paint the wall back white… oops! 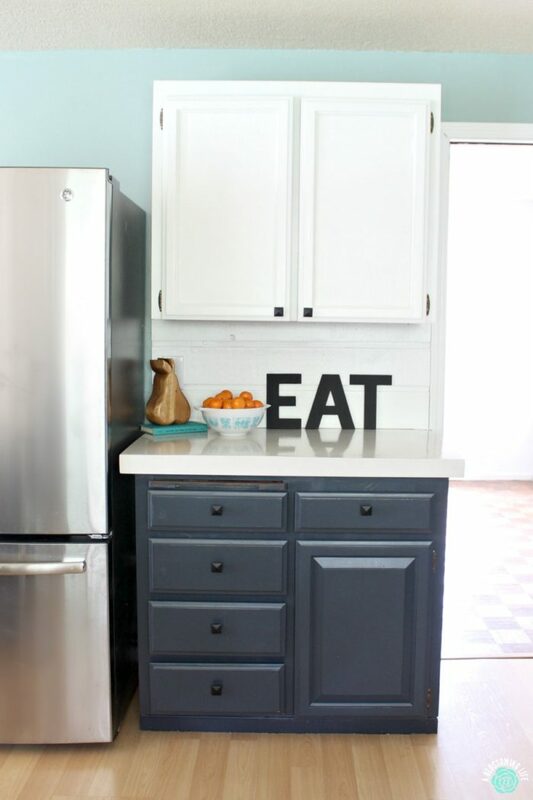 I painted this EAT sign blue, red, and green when we first got married seven years ago, and finally got around to updating the letters with a fresh coat of black paint. How much did we end up spending? We ended up spending probably a little under $7,000. A big chunk of it was the appliances (new fridge and range), the electrical, the countertops, and labor costs. The appliances alone were around $2,300, and they were on sale. 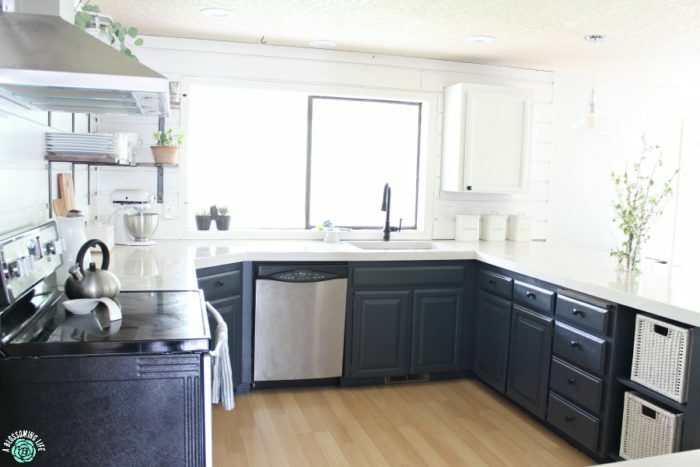 We could’ve spent a lot less if we would’ve made cheaper decisions, were a little handier and could’ve handled a few more of the projects ourselves, or didn’t paint the walls multiple times (I didn’t end up liking the first color we chose, so we repainted) only to cover them up with shiplap… oops. So, if we didn’t have to buy appliances, it would’ve been close to $4,500, which is pretty darn good to me! I’m really thrilled with how it turned out, and I love being in the kitchen. Don’t get me wrong, it definitely still has some quirks, but it brings such a calm and peaceful feeling being in the room. I love cooking and even cleaning my kitchen now – gasp! – because she is just so pretty! I’m so thankful and grateful for all our friends and family that helped us with this huge makeover. We literally couldn’t have done this without them! WOW What a transformation! Looks great!! Great job – and super inspiring! So true! I’m very thankful the cupboards were useable. Squeaky but they work haha. I cannot even get over this massive transformation. And I’m so jealous. I want your kitchen. Thank you Susan! You’re so sweet. It was lots of hard work, but totally paid off. Awesome! It looks beautiful. I like your transformation. Thank you for share such post. 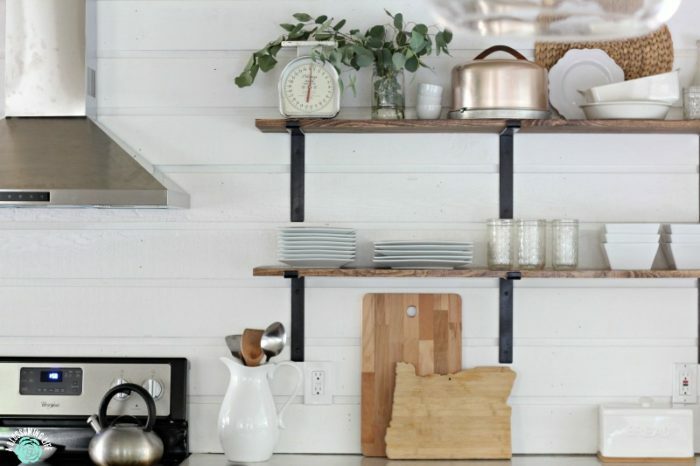 Your kitchen renovation gave me some wonderful ideas thank you for sharing this! I like how you made your kitchen brighter. Its a kitchen I would love to stay and cook in. Thank you so much. It’s definetely a space I want to cook in now! Great work on the remodel, so far it looks awesome and a big improvement from when you guys bought it. Looking forward to seeing the progress photos. Y’all have done an amazing transformation on that place. Thank you Jessi! We are about to start on more projects so there will be updates soon. Looks awesome! I like how much brighter and open it looks now. Great job, very inspiring.